Glenn Loury and I talked about it on Bloggingheads. We discussed the political economy of suburban poverty, rioting and the social contract, the necessity and the difficulty of achieving police legitimacy, the incredible social harm done through the looting of small businesses that accompany urban unrest, and order maintenance as a cooperative achievement of both the citizenry and the police. 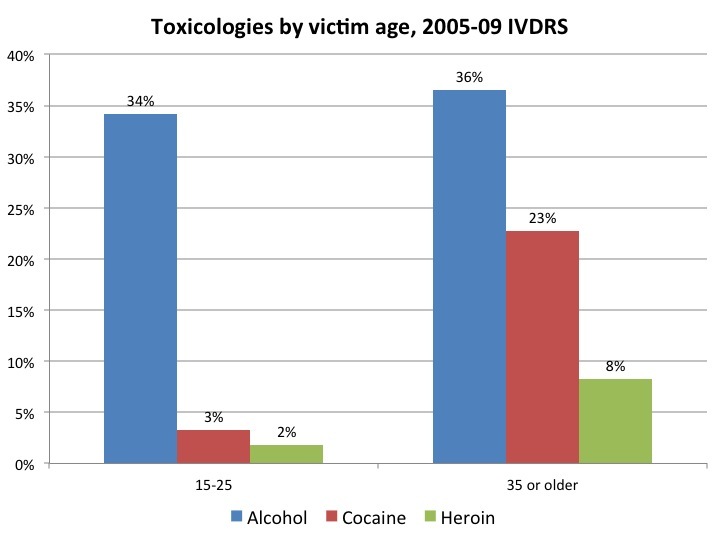 Which intoxicating substance is associated with the most lethal violence? Devotees of the Wire might presume that cocaine or maybe heroin would top the list. Of course the correct answer, by far, is alcohol. Itâ€™s involved in more homicides than pretty much every other substance, combined.Â Surveys of people incarcerated for violent crimes indicate that about 40% had been drinking at the time they committed these offenses. Among those who had been drinking, average blood-alcohol levels were estimated to exceed three times the legal limit. Lead causes crime. How much of the great crime wave and the great crime decline were lead-driven is unclear. Yesterday I returned to banging the (Kevin) drum about the pernicious effects of environmental lead. Both a note from a reader and comments elsewhere about Kevin’s latest post suggest that an earlier post of mine had created confusion. Mark, in your latest post, you seem to be believing the lead hypothesis for violent crime again. But here I thought you said that Phil Cook changed your mind. Are there new data that tipped you back, or is there a hole in Cook’s argument? Lead causes crime, and the effect size is large. Decreasing lead exposure was the primary cause of the crime decline that started in 1994. #1 is certainly true, and nothing Cook has written or said contradicts it. We have both statistical evidence at the individual level and a biological understanding of the brain functions disrupted by lead. Cook convinced me that #2 is not true, or at least is not the whole story, because the decline happened in all cohorts while lead exposure deceased only for the younger cohorts. You can still tell plausible stories about how the young’uns drove the homicide wave of the late 1980s/early 1990s and that less violent subsequent cohorts of young’uns reduced the overall level of violence, but that’s not as simple a story. In a world of many interlinked causes and both positive and negative feedbacks, the statement “X% of the change in A was caused by a change in B” has no straightforward empirical sense. So I’m absolutely convinced that lead is criminogenic, in addition to doing all sorts of other personal and social harm, and strongly suspect that further reductions in lead exposure (concentrating on lead in interior paint and lead in soil where children play) would yield benefits in excess of their costs, even though those costs might be in the billions of dollars per year. What’s less clear is how much of the crime increase starting in the early 1960s and the crime decrease starting in the early 1990s (and the rises and falls of crime in the rest of the developed world) should be attributed to changes in lead exposure. The original point of yesterday’s post stands: When you hear people complaining about environmental regulation, what they’re demanding is that businesses should be allowed to poison children and other living things. No matter how often they’re wrong about that – lead, pesticides, smog, sulphur oxides, chlorofluorocarbons, estrongenic chemicals – they keep on pretending that the next identified environmental problem – global warming, for example – is just a made-up issue, and that dealing with it will tank the economy. Of course health and safety regulation can be, and is, taken to excess. But the balance-of-harms calculation isn’t really hard to do. And the demand for “corporate free speech” is simply a way of giving the perpetrators of environmental crimes a nearly invincible political advantage over the victims. Lead exposure is criminogenic at the individual level. It’s tempting to attribute the big increase in crime after 1960 and the big decrease after 1994 to getting the lead out of gasoline. But it turns out those changes were period effects, not cohort effects. Kevin Drum, whose “Criminal Element” essay linking violence rates to lead exposure has been (as it deserves to be) extraordinarily influential, links to a BBC story in which a more-than-usually-dim criminologist explains that he disbelieves in the lead-crime link because all biological explanations of crime are outside “the mainstream” (presumably meaning “the mainstream of criminological research”). Kevin is right to say that the multiple levels of evidence for the lead-crime link (brain-imaging work, case-control studies at the individual level, studies of crime changes in neighborhoods that suffered greater and lesser increases in lead exposure after WWII and decreases in lead exposure after the mid-1970s, and cross-national studies) deserve more than a casual blow-off. It’s not, after all, as if “mainstream” criminology had a bunch of well-worked out causal theories with proven predictive power. Like Kevin, I’ve been frustated that the evidence about lead hasn’t led to more action, if only some serious experimental work removing lead from randomly selected buildings or neighborhoods and then doing developmental measurements on the childen in the chosen areas compared to children in control areas. And I was puzzled when I heard that the hyper-sensible Phil Cook of Duke was among the skeptics. My skepticism about the “lead removal” explanation for the crime drop stems from the same source as my skepticism about the Donohue-Levitt explanation in terms of abortion legalization. They have an exact parallel to the previous explanations for the surge in violence of the late ’80s by John DiIulio and others. The focus in both cases is the character of the kids: the belief that during the 80s the teens were getting worse and during the ’90s they were getting better. Even a fairly casual glance at the data demonstrates that whatever the cause of the crime surge, and then the crime drop, it was not associated with particular cohorts. It was an environmental effect 10 cohorts were swept up in the crime surge simultaneously, and the drop has the same correlated pattern. There is a natural inclination to assume that the reason the murder rate is increasing is because there are more murderers, and the reason we have fewer is that there are fewer murderers. It’s not that I rule out such explanations – I’m open to the idea of lead removal and abortion legalization – it’s just that I don’t think it explains the actual pattern of the youth violence epidemic, either up or down. More generally, my instinct is to look to the social and economic environment to explain large shifts in population outcomes. Here’s Cook’s paper with John Laub. Now, since youth violence surely has impacts on adult violence, finding that all the cohorts decreased their violence at the same time doesn’t quite rule out the idea that the younger cohorts were largely driving the train. And those brain-imaging, case-control, neighborhood, and cross-national results are still out there. But Cook’s objection remains a powerful one: the theory predicts that we should have seen the crime declines specifically in the birth cohorts exposed to less lead, and that’s not what we saw in fact. I’d still like to see some experimental work to figure out how much additional lead removal would turn out to be cost-justified (with crime-reduction benefits a significant, but but not the dominant, part of the benefit story), but the simple story “Crime declined because lead declined” now has a major hole in it. That’s too bad, because attempts to find the relevant social and economic causes haven’t gotten very far. To my mind, the crime boom that started in the late 1950s or early 1960s and the crime bust that started in the mid- 1990s (and other large-scale, decades-long swings up and down in crime rates elsewhere) remain largely unexplained in retrospect, as they were entirely unpredicted in prospect. Footnote And that, of course, is the difference between science and policy analysis on the one hand and mere advocacy on the other. Of course scientists and analysts are influenced by their values and prejudices. I don’t pretend that Jessica Reyes’s work didn’t make me happy or that Cook’s response doesn’t make me sad. The lead-crime story fits all my political prejudices, as well as my taste for simple and surprising explanations with clear policy implications. And I’ve been a loud advocate for it. But I don’t want to believe it if it isn’t true. We hit on gun policy, terrible journalism about Chicago crime, why I harbor some human sympathy for George Zimmerman, and why Tom Wolfe would have been such a superb observer of the urban scene–if only he weren’t such a horrible novelist. An unsympathetic outsider visits the Windy City. If you have to write a story about Chicago’s crime problem, you couldn’t do much worse than Kevin Williamsonâ€™s â€œGangsterville: How Chicago reclaimed the projects but lost the city,â€ on the web at theÂ National Review. To be sure, Williamson makes a few good points. He notes, for example, that the decline of disciplined hierarchical gangs may have brought unintended consequences. He reminds the youngsters of notorious Chicago gangsters Larry Hoover and Jeff Fort. In just about every other way, this piece illustrates much that is wrong in the way millions of Americans view the urban scene. He notes–but variously seems to forget– that it’s not Dodge City here. Chicago homicide ratesâ€”though up roughly 20 percent between 2011 and 2012â€”remain a notch below levels of ten or fifteen years ago. Homicide rates are way below the levels of the early 1990s and the crack epidemic years. Non-homicide crime rates have also declined. Our homicide decline has been too slow when compared with LA or New York. Still, many citiesâ€”Baltimore, Detroit, Cleveland, Camden–would love to have Chicago’s problems or our crime rate. The usual noises were made about gun control, and especially the flow of guns from nearby Indiana into Chicago, though nobody bothered to ask why Chicago is a war zone and Muncie isnâ€™t. Heraclitus said that no one can step twice into the same river. By the same token, it isn’t really possible to do the same program in two different places. The answer seems to be that you could try to do something based on similar principles and with similar aims, but you couldn’t really do the program in its trademark style, and even if you’re convinced 24/7 works on drunk drivers in Sioux Falls you can’t be sure that the alternative version would work on drunken wife-beaters in Glasgow. That suggests a more general reflection. Heraclitus said that no one can step twice into the same river. By the same token, it isn’t really possible to do the same program in two different places.